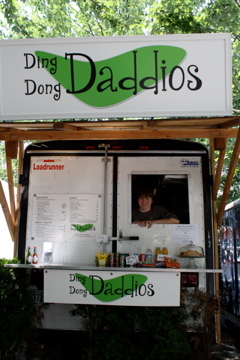 Earlier this year, Tara and I bought a food cart in downtown Portland. I don’t think anyone was more surprised than me when we did it. I’ve always claimed to have ZERO entrepreneurial spirit. And it was true. I find comfort in the idea of being a number, a cog in a much, much bigger machine. Cogs get benefits: medical insurance, sick days, 401k. I like the idea that someone else is also contributing to my retirement. Not to mention the stable, secure (much higher) annual salary. And bonus. I liked my bonus a lot. I’m going to miss that. But with the changes in national and global economy came changes to corporate structure. It was difficult to watch a company that I loved transform into something…different. When we realized the opportunity available in an area that is thriving despite economic difficulties, we talked about what it would mean for me to leave the security of my daily 9-5 (Who am I kidding? I worked way more hours than that!). And I was scared to do it, but the arguments in favor of doing so were compelling. Most noteworthy was my need to not go quietly insane. What price can a person really place on mental health? So, we took a couple of deep breaths, then we did it. One really big check later, and it was ours. With that, everything changed. I gave notice at work and a few days later a vice president showed up to try and talk me out of leaving. She was unsuccessful, but I was still flattered. Three weeks later, I was self-employed. Mentally, there is a fine line between unemployed and self-employed. Even though I was working HARD, it took several weeks for my brain to stop yelling “Oh my god! I quit my job! I’m unemployed!” I still struggle with the newness of it all. Prior to opening Ding Dong Daddios, Tara spent her time at home taking care of our (too) many children. We stumbled across the concept when Tara realized she’d be at home with nothing to do this fall when our youngest started school full time. Tara knew she’d be happier working for herself than for a major company, so we started by looking at coffee stands. A small, self contained business with the right hours and she could do it alone. We trolled craigslist looking for opportunities. When I saw the first ad for a food cart, I was intrigued and excited. Tara took a little more convincing, but when we looked a little closer, she was convinced. The coolest thing by far about owning a small business is the flexibility with the schedule. Tara and I have lived together for over 17 years. We know some basic fundamental truths about our relationship. For example, we like each other much better with a little bit of separation. Working together inside a tiny trailer would only result in divorce for the two of us. Another truth is that it’s incredibly important to both of us that our children be raised at home by one of their parents. It doesn’t matter which of us is with them, as long as it’s one of us and not a local day care. Our solution was to set up a rotating schedule. For example, Tara will work Monday through Saturday, I’m home with the kids. We take Sunday off as a family day. Then the next Monday, I’ll work for a week and Tara will stay home with the kids. Tell me where in corporate America you can job share on an alternating schedule with your spouse? Unfortunately–or fortunately depending upon how you think of it–it’s too busy for one of us to do it alone. That’s where our oldest daughter comes in. Michelle is 24 and, like many young people today, between jobs. She is the perfect solution for our staffing problem. She has the time and is vested in our success. This week she had a surprise waiting for me. She borrowed the ipod that we keep in the trailer and added a bunch of music. Some of it, like the Eminem, I immediately forward through. Others, like the Melissa Etheridge, I smile and think back to when I was her age and first met her mother (Tara). But the real delight was the smattering of songs she included from an obscure German film called Bandits. The movie released in 1997 and I took Michelle to see it at one of the independent theaters in Portland. This is the movie that convinced her that subtitles aren’t inherently evil. The movie is about four women in prison who form a rock band, escape from prison, become nationally famous overnight which makes it even harder to run from the police. Here’s the trailer on YouTube. We were busy when the first song came on and I didn’t even realize it until it was half over. Michelle kept watching me, waiting for a reaction with a small smile on her face. When I realized what was playing, I hit the back up button and turned it up. I sang along loudly and out of tune with a not-so-small smile on my face. The song is called Catch Me and it was a perfect way for her to say she remembers and I love her for reminding me.